When I started in the photography industry, the idea of bidding on a job was daunting. There were so many things to consider and it all felt overwhelming. Then, my perfectionism kicked in and I had to have everything looking just right. Needless to say, I overwhelmed myself with a pretty straightforward process. Granted, I say this after bidding my fair share of work and making plenty of mistakes. So, I wanted to put together a lite guide of things I consider when I'm bidding a job. Hopefully new photographers will find it helpful. To preface this entire post, please know that this process may not work for you. In fact, it may not work for me in a couple months, years, or at any point in the foreseeable future. Bidding a job is something that will take time to build confidence. And, just when you think you've got it figured out, you'll hopefully advance your career, potentially returning you where you started -- or at least it may feel that way. 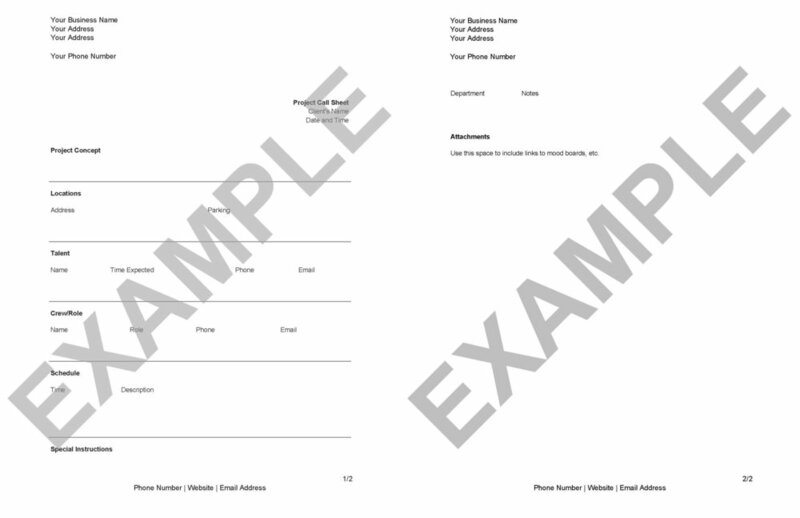 To aid in the process of bidding a job, I've added a couple documents that I typically use when getting numbers together. The first document outlines some of the basic things I think about and some generic language for an agreement. Like any contract or legally binding document, it's best to have an attorney look things over. There are entire sects of attorneys devoted to working with artists. For more on that, check out Volunteer Lawyers and Accountants for the Arts. They have a plethora of resources and services tailored for growing artists. The second document outlines some things to think about once your bid has been accepted, which is typically called a call sheet. Call sheets are excellent for getting everyone together. They lay out key factors to consider while getting prepared and actually being on-site. They won't hold things together, but with enough shared information, things may run reasonably smoothly. So, back to bidding on photography work. One of the most daunting tasks is setting prices, and I'm here to tell you, it doesn't get too much easier. Nevertheless, there are a number of things you can take into consideration to determine your hourly rate; that includes what it costs for you to replace equipment, maintain electronic services -- think Adobe Creative Cloud and the like -- and to just keep the lights on. When I started, I outlined everything I would have to replace in the next five years, thought about how much I had to make to maintain my lifestyle, and divided everything by the number of jobs or hours I thought I could reasonably book in a given year. I'll be honest: my number was far too low. So, I went back to the drawing board and continued to work on my pricing structure until I got to a point where I thought I was comfortable. At the end of the day, this number will change for a variety of reasons: the time of your life, the size of a job, or a number of other events. I've spoken to some photographers who will adjust their rate to work with companies or brands they admire, so don't feel shackled to that number. Sometimes opportunities arise where you have to charge more, or even charge less. Once you've got a general idea of your number, it's important to review each job description carefully for variables that may get in the way. Some jobs may outline that they want a photographer on-site for a half-day, but they want an unrealistic number of photographs captured. You have to understand you capacity and capabilities when it comes to any job. In addition, this is a great time to review the concept behind the shoot and begin brainstorming what it will look like. For me, I use a mixture of Pinterest boards and actual PDFs. I will typically send one or the other depending on the audience. If you only leave this page with one thing, remember that it's always better to ask questions when you are unsure about a shoot's outline. I always follow up with questions and clarifications. The more you know, the better you will understand how much to charge and what it will take for you to get the work done. Ask questions. Once you've understood the variables of the shoot and determined your price, it's time to compile everything. If you're bringing other people on to assist, you may have to reach out to see what they charge. Moreover, you may have to reach out to find out more about location costs, and if the shoot calls for it, renting equipment. As I said earlier in this post, there's a document below that's similar to what I use for bidding jobs. There are some excellent resources out there to help streamline the process, like BlinkBid, but I've found it pretty easy to plug my information into a spreadsheet in a Google Document. Then, I just turn the table white and it blends into the page. That's what I did below. Pretty slick, huh? I always make it a point to reiterate the shoot in my own language within the bid. That way, if I misunderstood anything, it will be brought up and we can talk it out. Trust me, it's better to understand what they client wants. Then, you can spend time telling them what's possible and what isn't -- particularly within their budget. Make sure to include your fees, any fees associated with your crew (should you need anyone else), location fees, rentals, etc. For some clients, you can lump things together. For example: "Photographer and two assistants for a half day - $$$$." Other clients will want everything spelled out. It all depends on the client. Do what makes sense for you and know that the client may ask you to expound on your requests. I mean, think about it: you're spending their money and they may want to know exactly where it's going. To me, that doesn't seem like too much to ask. Then again, I've always lived by the model of transparency. When you've got it all together, leave it along for an hour or so and then come back for another glance over. Make sure you've spell checked everything and added the correct number of zeros. Then, send that bad boy off and play the waiting game. When it comes to the call sheet, it's more of an internal document. Keep it professional and outline necessary information you may need for the shoot. I use the call sheet as a way to get everyone's contact information together and explain interesting information about locations. For example, I often find myself shooting headshots in random offices. When this arises, I make a note when there are different lighting sources in a single space. During a shoot a couple weeks ago, I found that the client had four different color temperature lights in a single room. That made things interesting and was something I could have outlined in a call sheet. At the end of the day, don't fret too much over small details. You may make mistakes and that's alright. You may undercut yourself on a job... and that will hurt, but it will be one heck of a learning experience. Treat the whole thing as one big learning experience and remember that you get to have fun taking pictures for a living - or for an almost living. Good luck.